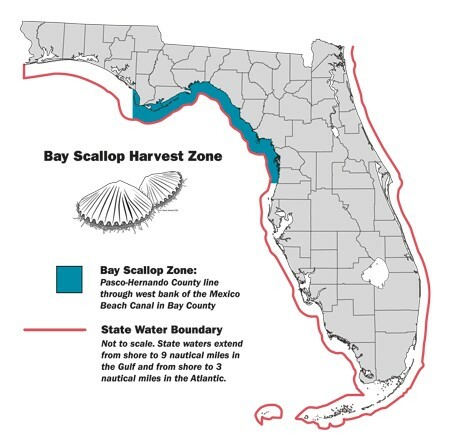 TALLAHASSEE – Today, Governor Rick Scott announced the bay scallop season will open three days early this year. Opening the season early and on a weekend will create additional recreational opportunities for Florida residents and visitors while recognizing the importance of economic benefits to coastal communities where this activity occurs. The Governor’s letter requesting FWC to open the bay scallop season early can be viewed here. The season, which usually opens July 1, will open Saturday, June 28, 2014. The FWC will also bring a proposal to its Commissioners at a future meeting to change future season openings to the Saturday before July 1, unless July 1 happens to be a Saturday. The recreational season will open in Gulf of Mexico state waters (shore to 9 nautical miles) from the Pasco-Hernando county line to the west bank of the Mexico Beach Canal in Bay County. The season will remain open through Sept. 24, with the first day of the closure on Sept. 25. All other regulations, including bag and vessel limits, apply. Learn more by visiting MyFWC.com/Fishing and clicking on “Saltwater,” “Recreational Regulations” and “Bay Scallops.